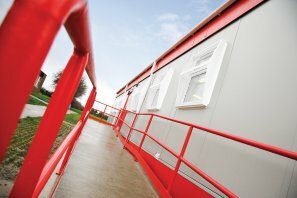 A recently installed six bay double classroom building commissioned by a local authority in Grimsby. The building is finished externally in low maintenance plastisol steel and internally provides two air conditioned classrooms c/w a central entrance lobby and two stores. The building was delivered to site and handed over to the client within 10 days. Clients report following completion: "a refreshing change to deal with a contractor who is professional, organized and accommodating"